The world of modern dressage includes an entire canon of doctrines, which are never questioned, either individually or in form of the system, which they present in their entirety. Everybody seems to have a clear and complete comprehension of their meaning. However, what does it really mean to drive the horse ‘onto the bit’? Does a stronger application of the rider’s aids really encourage the horse to place its hind legs further under its body? Is the term collection really synonymous with the increased forward engagement of the hind legs under the centre of balance? Jean-Claude Racinet subjects these and other questions, regarding the anatomical and biomechanical points of view, to a critical analysis and uncovers many things in this context, which contradict each other. 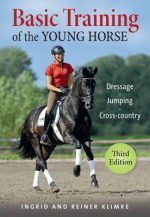 This book, a summary of decades of extensive experiences as a rider, offers a long-overdue contribution towards the discussion of the sense and nonsense of the training doctrines commonly used and applied in the modern form of dressage. It deals effectively with prejudices and is aimed at supporting the art of horse-orientated equitation.